inalienable rights that all men should have. the terrible disaster that your order would bring. but for everyone for over a hundred years hence. when you left behind the best and the bravest. today who understand what was really lost that bloody day. that the constitution was in your hands that day. but so did the rights of every state that was free. and Love for God that you must have known. But had you not read where it is written? "Do not test the Lord your God"
knowing that you left it in His hands. the Lord did not wish it to be so. gone out and the gallantry is not forgotten. in this great nation because His will is always done. 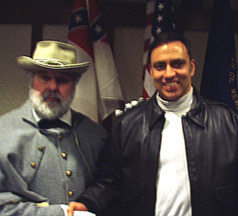 COMMENTARY: Robert E. Lee has long been a great hero of mine and I have cherished the hope that when I go to be with the Lord He will grant me the opportunity to meet Robert E. Lee in His kingdom. I always thought that studying the life of Robert E. would be as close as I would come in this World to meeting him until I recently had the great privilege to meet David Chaltas.